Welcome to the official Lost Boys Ultra Trail Run - 50 Mile / 55 Kilometer website! 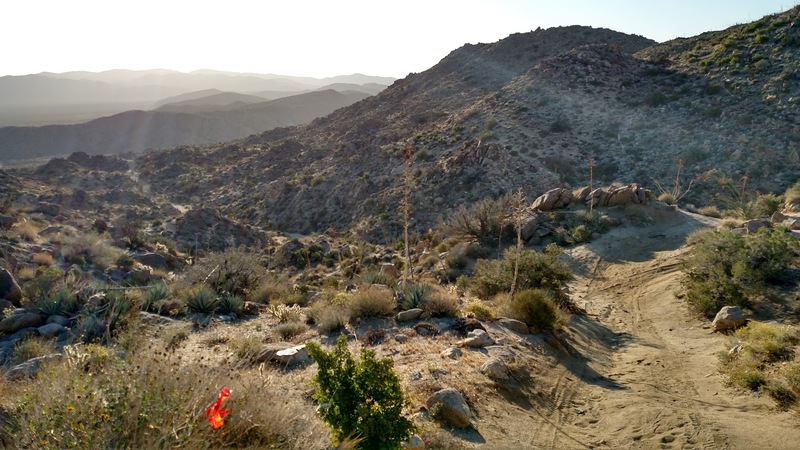 The Lost Boys Ultra was a rare point-to-point course that started in the beautiful Anza Borrego Desert in San Diego county California at 1,100-foot elevation, tops off on Cuyamaca Peak at 6,512-foot elevation, and ends at Cuyamaca Lake in the Cuyamaca Rancho State Park. With over 9,000' of climb and 6,100' of descent for the 50 mile race the course really packs a punch. This is a beautiful but extremely challenging run featuring spectacular geography, historical trails, contrasting landscapes and incredible views. The first half courses through desert washes, canyons and mountain valleys including a brief section where runners must climb over some dry rock waterfalls. Ascending out of the desert, the mountainous second half climbs and descends through a lush alpine environment. The 50 mile race has approximately 28 miles of trails, 4 miles of desert washes without roads or trails, and 18 miles of jeep roads. All but 4 miles of the course is contained within the state parks. 2018 Was the last running of the Lost Boys Ultra for a season (read why). Hopefully we at Cliffs and Meadows can revive this epic race again some day. Joel Meredith from Nashville TN wins the 2018 running of the Lost Boys 50 Mile Trail run in 8:31:12! Local Gemma Bachmann wins it for the women in 11:34:08! (50 mile complete results). Congratulations to all participants! And a super huge thank you to the volunteers which have made this 2015-2018 Lost Boys Ultra reboot possible. A note on the MEDIUM SHIRTS: Attention runners: At the event we thought we ran out of medium shirts, later we found a full box of them. If you did not get the correct size please email me and we can get you your shirt! Cliffs and Meadows is thrilled announce our support for Run Far! Who's mission is to to raise awareness about veteran suicide and PTSD while providing scholarships to the children of fallen United States Military service members that have taken their own life. In referring to his love for the Lost Boys 50 mile Endurance Run, course record holder Ben Hian said: "I am so excited this race is coming back. There is something primitive about running from the desert to the mountains." Drive east along Highway 78 past the old California gold mining town of Julian until you find a place called Pinyon Wash (call-box number 78-810 at elevation 1,100 ft); which is on the side of the highway in the middle of nowhere in the Anza Borrego State Park. Step out of your car, grab a water bottle, and set out on foot. Run along the dirt roads, through desert washes, and the open desert floor for several miles. When the trail runs out keep moving through the desert without trail. When you come upon the dry waterfalls do what any reasonable nomad would do – climb up and over them. Continue heading west until you bump into the base of the Laguna Mountain range. Make the 3,000 foot ascent into the mountains via the steep canyons known as Oriflamme and Chariot. Once on top weave through the single-track runnable trails across grassy fields and panoramic view of the remaining 16 miles of your adventure. Look for the tallest peak in the area (Cuyamaca Peak at 6,512 ft) and of course head directly for it and climb it. On your way there pass the dormant Stonewall Goldmine and enjoy the canopy and smells of the tall pine trees. If the sky is clear you will see the Pacific Ocean from the peak. Finally turn your attention to Cuyamaca Lake which is within your view below. Head downhill over rocky technical trail and dirt roads. Aim for the west shore of the lake where some food, friends, and a chair awaits you. Do all of this in under 15 hours wearing a bib and with the support of aid stations and you will have completed the Lost Boys 50 Mile Trail Run. The LB50 was first run in 1991 and had four finishers (Mike Suter, Tom Waddell, Bud Willis, and Wes Barrett). The rare race has been loved ever since and was run 12 times off and on between 1991 and 2018. Brian Gonzales was the race director for the most recent reboot for the races ran in 2015, 2016, 2017, and 2018.